Looks promising, but how will ray tracing scale down to an even lower tier GPU, and how much will it cost? When Nvidia initially announced the GeForce RTX lineup, we had to wonder if there would be an RTX 2060, or if Nvidia would keep GTX branding on the lower tier parts. After all, ray tracing, as we've seen in Battlefield 5, is quite demanding. 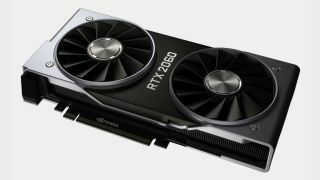 Cutting the RT cores in half to go from a 2080 Ti to a 2070 makes even 1080p ray traced gaming questionable, and obviously RTX 2060 will have even fewer cores. But based off early leaks of performance using the Final Fantasy XV benchmark (shout out to Tom's Hardware), it looks like RTX 2060 is indeed coming. The good news is that performance appears to be a decent improvement over the GTX 1060 6GB, at least based off the FFXV test. At 4k high, the RTX 2060 scores 2589, and that appears to be without DLSS (since the high preset doesn't enable DLSS AFAICT). By comparison, the GTX 1060 scores 1985, GTX 1070 scores 2749, and RTX 2070 scores 3927. So in this one test at least, we're looking at a potential 30 percent boost to performance over the previous generation. The Final Fantasy XV benchmark generally agrees with my overall performance results. A GTX 1080 scores 3401, so by that metric, a 2070 is 15 percent faster than the 1080. In actual gaming benchmarks, I show an average performance advantage of 12 percent for the 2070, so that seems reasonable. The RTX 2080 Ti vs. GTX 1080 Ti shows a 35 percent performance advantage in FFXV benchmark, at 4k at least, and I show an overall 33 percent performance lead from testing twelve games. One likely explanation for the performance is that the RTX 2060 will use a trimmed down variant of the TU106 architecture. Disable one of the GDDR6 controllers and 12 of the SMs and you'd have a 1,536 CUDA core part that should perform roughly where we're seeing the 2060 land. You'd also have just 24 RT cores, and 192 Tensor cores, which is on the low end for doing ray tracing or DLSS. Or Nvidia may have a separate TU107 chip to fill this market niche. What we don't know is how much Nvidia will charge for the RTX 2060, or when it will come out. Given the recent launch of the Radeon RX 590, which beats the GTX 1060 6GB by around 12 percent, Nvidia will most likely want to reclaim the midrange crown. To do that, a price of $300 or less will get the job done, and based on the other RTX cards I think that's as much as we can hope for. Regarding the launch date, we first saw leaks of the RX 590—also in the FFXV benchmarks—about a month prior to the card's official launch. That would put the RTX 2060 on the launch pad for some time in December, though don't be surprised if it gets pushed into January.